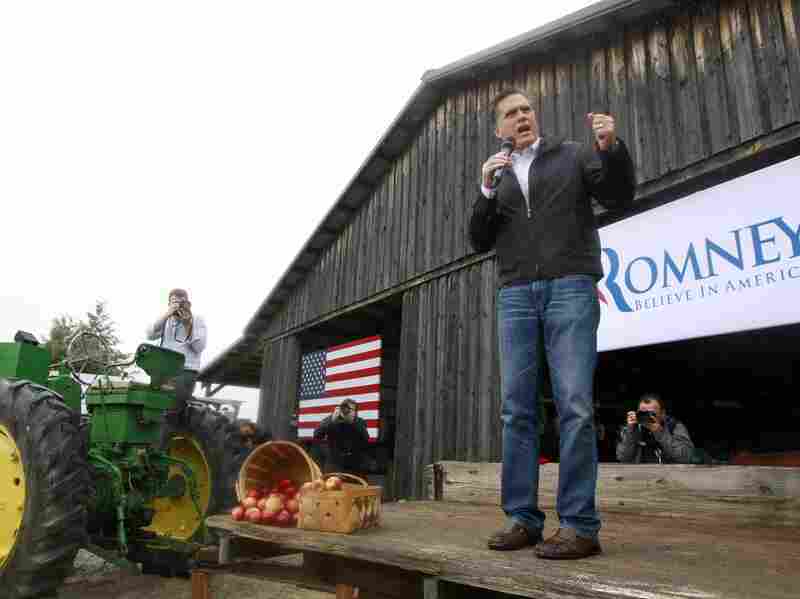 Poll: Romney Opens Large Lead In Rural Swing Counties A new bipartisan survey shows a surge for Mitt Romney in a key voter group following the first presidential debate Oct. 3. He leads President Obama in rural swing counties by 22 percentage points. Explore the latest NPR coverage of GOP presidential candidate Mitt Romney. "What Republican candidates need to do is to rack up big margins in rural areas in order to offset smaller [Republican] margins in urban and suburban areas," says Dan Judy of North Star Opinion Research, the Republican polling firm that participated in the survey. Respondents: 600 likely voters in rural (nonmetropolitan) counties in nine battleground states. Sponsor: Center for Rural Strategies, a nonprofit and nonpartisan rural advocacy group based in Whitesburg, Ky.
"Mitt Romney really needs to be at 60 percent or above in [rural] areas to offset some of those [urban and suburban] margins," Judy adds. The new survey shows "he has surged into a huge lead, and I think it is fair to say that his increased lead among rural voters is what is helping him in these swing states overall." The nine battleground states of Colorado, Florida, Iowa, Nevada, New Hampshire, North Carolina, Ohio, Virginia and Wisconsin have a collective rural population of 13.6 million, according to the Census Bureau. "It's a boon to Romney," says pollster Anna Greenberg of Greenberg Quinlan Rosner Research, the Democratic partner in the survey. "It will help him ... because, of course, he will lose urban areas by a similar margin. And the suburban areas are still pretty competitive." Last month, a similar rural survey in the same battleground states had a smaller 54-to-40 percent margin for Romney. Greenberg and Judy say the first presidential debate made the difference. "Voters in rural areas were holding back from Mitt Romney for a variety of reasons, ranging from more conservative voters not being very high on him to the perception of him as an elite and out of touch," Greenberg says. "The debate went a long way to making rural voters more comfortable with him in the way they were comfortable with George Bush." Judy notes that "these really are Republican base voters ... coming home. They're 85 percent white, 50 percent conservative, and two-thirds of them attend church at least a couple of times a month." The first debate made a difference to Sarah Sajuan, 31, an assistant to a physical therapist in Paulding, Ohio. She shares Romney's social values, she says, but was offended by the surreptitious video in which the Republican presidential candidate was dismissive of what he said were the 47 percent of Americans dependent on government. "I didn't like the negativity of the 'unimportant Americans,' " Sajuan says. Before the debate, she leaned toward Obama, believing he would do a better job on taxes, rural issues, women's concerns and health care. "I thought he was a stronger person and would stand up for what he believes in," Sajuan recalls. "But after that debate it really made me question, maybe, his authority." Romney's debate performance wowed her due to "his strength, his voice and just his appearance." So when pollsters called her last week, she told them she was casting her vote for Romney. She told NPR, though, that she may still change her mind. 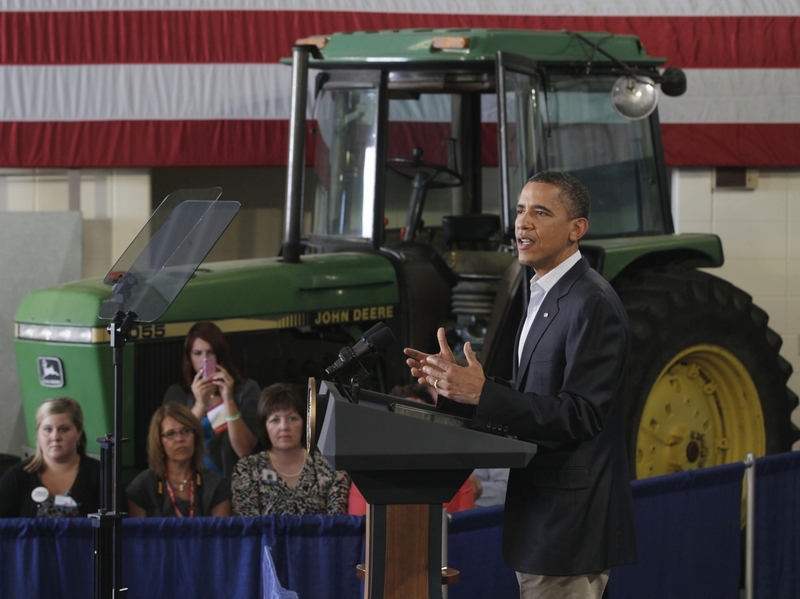 President Obama speaks at a rural economic forum in Peosta, Iowa, during his three-day economic bus tour on Aug. 16, 2011. Retired veterinarian Raymond Shuffler, 59, of Union Grove, N.C., says the last Republican presidential candidate he recalls voting for was Gerald Ford in 1976. But the first 2012 debate between Obama and Romney helped cement his commitment to the Republican. "I think he's a man who can look at spending. He can look at taxes," Shuffler says. "He's always been a competent manager." Shuffler voted for Barack Obama four years ago largely because he disagreed with John McCain's choice of Sarah Palin as the vice presidential nominee. He says he kept an open mind about supporting Obama again. "His basic philosophy sounds good," Shuffler says of the president and his health care initiative. "But his implementation of it is not working." Michael Roby, 65, a retired factory worker from Logan, Ohio, is leaning toward the president, crediting him with getting the Affordable Care Act passed. "At least he moved it off the starting line," Roby says. He says the same about Obama's 2008 bailout of the financial system. "Somebody's got to do something," he adds. But Roby admits to being persuadable. He'll record Tuesday night's second debate so he can go back and scrutinize it for who sounds better on maintaining and creating jobs, and bolstering Medicare, Medicaid and Social Security. The rural voters responding to the survey overwhelmingly believe Romney will do a better job with the economy, with representing their views on taxes, with sharing their values, with saving Medicare and Social Security, with addressing the needs and concerns of the middle class and with reducing the federal deficit. On the president's Affordable Care Act, 60 percent said they disapproved. This is an educated voter group, by and large, with more than 60 percent saying they attended college, earned college degrees or studied in post-graduate school. Close to one-third collect Social Security and/or Medicare benefits. More than half are older than 50. President Obama rated almost even when it came to addressing the needs and concerns of women. He was close to even on which candidate would do a better job with women's health and which represents the respondents' views on health care, despite the strong disapproval of Obamacare. "There are still issues that are contested in rural areas," says Democratic pollster Greenberg. "It is possible [for Obama] to battle back." But Republican pollster Judy is skeptical. "I think that Mitt Romney would have to have a pretty catastrophic performance [in the remaining debates] to lose some of the gains we've seen here," Judy says. Both Judy and Greenberg agree that Obama's rural battleground plunge could hurt Democrats who are seeking or trying to hold on to U.S. House and Senate seats in those same states. "In these swing states, there are a lot of very, very close Senate races," Judy says. "Whoever is able to prevail in these swing states will likely bring along enough Senate candidates to give his party control of the Senate." Greenberg adds that Romney's gargantuan lead in rural counties in battleground states makes it harder for Democrats to win Senate and Congressional races in rural states. "It still can be done, and there are lots of really solid Democratic campaigns in these areas," Greenberg says. "But it obviously makes it that much harder to win in those races." The survey was sponsored by the Center for Rural Strategies, a Kentucky advocacy group, and funded by the Carnegie Corporation of New York, a private foundation. Additional analysis of the survey is available at The Daily Yonder, a rural news service from the Center for Rural Strategies.